Highly modified Victory with over 1,000 hours Build Time. Garret GT20 Turbo - Boondocker NOS Injection - Jeff Oltman ECU - Metanol Injection - Beigt Ramping Pressure Regulator - Greedy Blow-Off Valve - NASA Certified Thermal Barrier Intake Shield - GSXR Steering dampner milled into triple trees - Hand rolled front fender. Modified Victory Vision Fairings - Handmade engine scoops, handlebars, rear section, dash section & bags, Exhaust Gas Tanks - Custom Hydraulic Clutch - Integrated Vision Taillights – Custom Built Progressive Suspension - Don Thompson Seat - Twin Oil Coolers - Remote Controlled Bags - Hand Made Speed Rack - Integrated Gauges. This Show Bike has less than 100 miles since it was built. The odometer reading is from the donor bike. 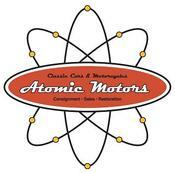 Atomic Motors is a full service restoration, sales and consignment dealership, licensed and bonded in the State of Nevada. We offer services dedicated to the car and motorcycle enthusiast or collector. Our indoor, climate controlled, secure facilities include motorcycle and classic car showrooms and restoration and fabrication shops. Come down and visit us - view our selection of classic vehicles and motorcycles and watch our restoration experts at work. We are conveniently located about a mile and a half east of Galleria Mall in beautiful Henderson, NV. We are only a half hour from the McCarran International Airport and the famous Las Vegas Strip.